Home Food	Presenting the 2018 Smarty Holiday Hostess Giveaway! * Giveaway is closed. All winners have been notified. Smarty girlfriends – we are about to embark on what we call the “fund the babysitter” season – AKA – Holiday Party Time! Festivities kick off tomorrow night, then we’re on a non-stop roller coaster from there on out. After you secure the babysitter, pick out your fab attire, and whip up something amazing to take to the party, don’t forget that one important thing – a little something something for the hostess! Certainly, there’s the old standby bottle of wine (the usual, totally uncreative gift-of-choice), but we’ve put together a few suggestions that will hopefully stand out in the crowd. P.S. 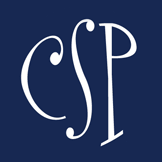 There’s also a super fun giveaway – one of each item will be given away to some extremely lucky CSP readers. Merry, merry! It started out as a summer project with her daughters in 2011. After working for years in the stationery and personalized gifts industry, Julie Tassy wanted to teach her children how to develop a product line. 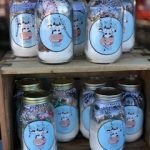 Ella B. Candles was established to personalize a line of candles for her local customers. Each of the beautifully fragranced, hand-poured, pure soy candles was named after a Charlotte neighborhood, landmark or street. 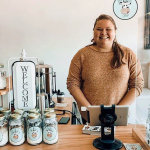 Now, as a full-service custom candle company, they serve about 1,000 stores across the country. 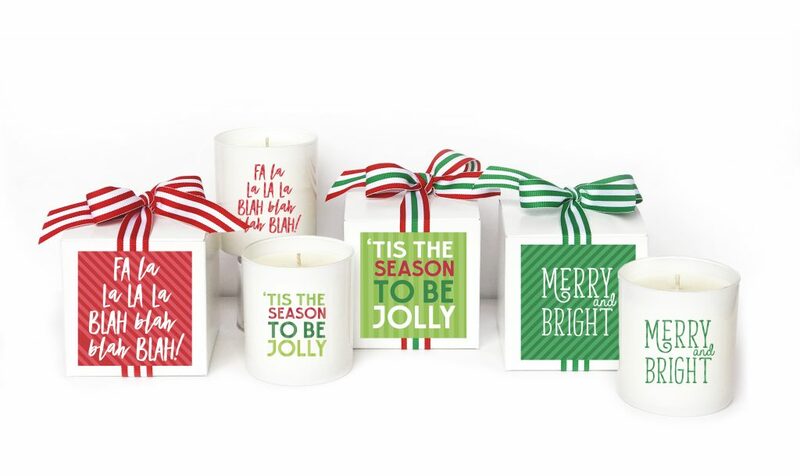 Team Smarty’s go-to gift this season is Ella B. Candle’s new holiday candle collection. Perfectly giftable, you can stock the gift closet and be ready for your Christmas gatherings! And our lucky Smarty gets her pick of three amazing new fragrances. You can also design your own candles online to give as holiday gifts, party favors, or to create a signature candle for your home. Get Social with Ella B Candles! 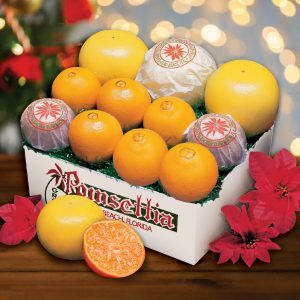 Navel Oranges are Florida’s Most Popular Orange! Click here for their Catalog. 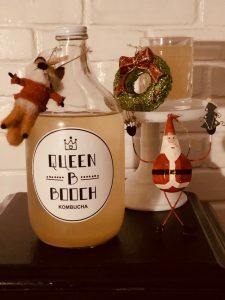 We recently discovered Queen B. Booch at a local Pop-Up. It was love at “first taste.” Next time you are headed to a holiday cocktail party or spend the weekend at a friend’s house, you are going to want to show up with a 64 oz. growler full of one of their signature Kombucha flavors. I promise, you will be the hit of the party! Queen B. Booch is handcrafted right here in Charlotte. This local company was started by two middle school teachers as a grassroots passion project. Their signature flavors are lemon lime, mandarin orange, grapefruit mint, and pineapple jalapeño. Right now they also have two winter seasonal flavors: gingerbread and spice cranberry apple. Click here for local locations where you can purchase small bottles. Beautifully Crafted. Thoughtfully Constructed. A Statement in Quality. Cut and sewn by hand in Maine by designer, Jasmine Clayton. Kurier offers Handmade items from the finest Italian and American leathers, industrial strength thread, and premium antique brass and steel hardware. Well known for their amazing handbags, I first came across the Kurier brand while ordering coffee at a small coffee shop. 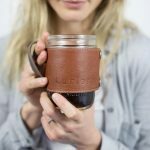 Sitting on the counter were several mason jars wrapped in leather with a handle. I was instantly sold! I needed to investigate. I learned they were called “Camp Mugs.” I am the proud owner of at least 6 of them now. The lid, the leather wrap, the size.. everything about it is pure function and not to mention super cute . Smarties, I feel like I need to apologize. I have been holding back on you. I have known about Bixby & Co.’s Drinking Chocolate for three years now and have kept it to myself. I was first introduced to Bixby & Co.’s signature line of Drinking Chocolate over the holidays while visiting my parents’ house in Maine. 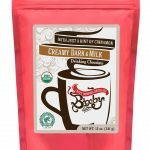 Bixby & Co.’s chocolate is a local favorite and I definitely can see why —> It is the BEST hot chocolate I have EVER had! There are several flavors to choose from Rich Dark Chocolate, Creamy Milk Chocolate, Mayan Spiced Dark Chocolate and Smooth White Chocolate. 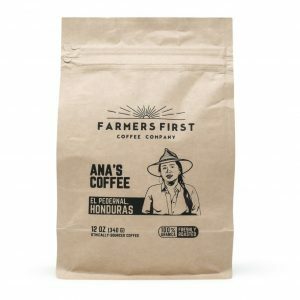 *My favorite is Organic Creamy Milk & Dark Drinking Chocolate: A delicious blend of our Rainforest Alliance Certified Milk and Dark Chocolates with a Dash of Cinnamon. It is suggested to combine with your choice of “milk” for a warming drinking chocolate experience in the European fashion. 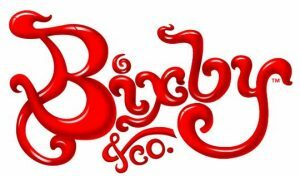 Get Social with Bixby & Co.
Poppy Hand-crafted Popcorn is a small batch, all natural popcorn company in Asheville, NC. Every batch is made from scratch using real ingredients (nothing artificial ever) in our kitchen. 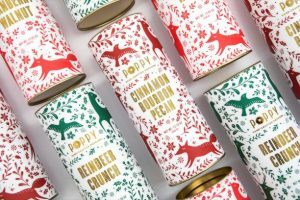 The holiday flavors are amazing & in the most beautiful packaging yet. Your host will love you for popping by with these delicious treats! Seriously, this is the best popcorn we have ever tasted and we are huge popcorn fans. Check out all of their flavors online that range from pimento cheese to cotton candy to chocolate peanut butter to chocolate peppermint bark. You can order online, but also can find Poppy locally at Reid’s, The Fresh Market, Blis Gift Boutique Uptown, & Eliza B’s. One lucky CSP winner will receive a holiday cylinder of the Reindeer Crunch and one of the Chocolate Peppermint Bark. Value of $39.45. 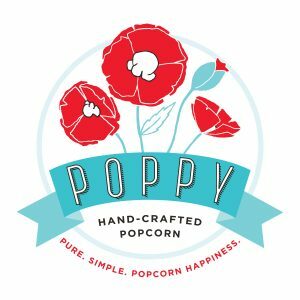 Get Social with Poppy Hand-crafted Popcorn! 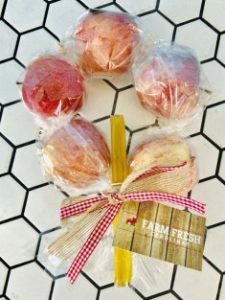 Looking for a different kind of hostess gift? 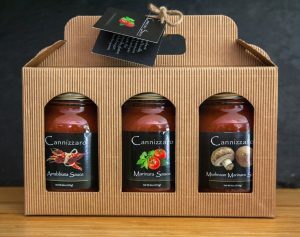 You can’t go wrong with anything from Cannizzaro Sauces. They are a locally owned business making fresh, Italian sauces by hand. They are a husband & wife team and use only the freshest ingredients. Once you’ve tasted the sauces by Cannizzaro, there is no going back. You’ll be in love! One lucky Smarty wins 3 Sauce Pack in a Cute Gift Pack. Marinara, Mushroom Marinara,& Arrabbiata Sauces. valued at $20. You can never go wrong with giving the gift of homemade cookies! We are excited to introduce you to Milk Mustache Cookies. Local to Charlotte. It was a somewhat wandering road that led me to my cookie dreams. After a few years in the entertainment industry and dabbling in elementary education, my weekend passion for baking began to take over. While I always enjoyed baking, it wasn’t until 2017 that I really thought to make those dreams a reality! After a lifetime of sampling and several months of testing, I found what I considered an amazing cookie recipe. And others seemed to agree! Thus, Milk Mustache Cookies was born. I love doing what I do, and I hope you enjoy eating them as much as I do baking them! One lucky smarty will win a chocolate chip cookie mix mason jar. Valued at $15.00. Click here to see the different cookie flavors. 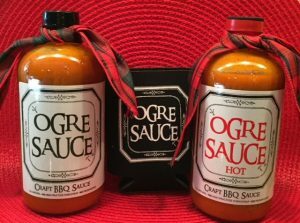 Locally made Ogre Sauce is an awesome gift for the friend who loves to grill. Who doesn’t love something that makes cooking tastier? Ogre Sauce is an all-purpose BBQ sauce created in Charlotte. We call it “all-purpose” because it is great on everything – not just traditional barbecue. You can slather it on ribs, wings, salmon, pizza, chicken, burgers, tofu, oysters, pretzels, steak, pineapple, grilled veggies, tunafish, eggs and more. They have something new this year also with the addition of Ogre Sauce Hot! We are so excited to give this a try too. Gift either one or both to your neighbor, your hubby, your in-laws. Everyone will thank you. It’s that good. You can find Ogre Sauce locally at their location in Southend or at Whole Foods, Reid’s, Peoples Market, & BlackHawk hardware. Sunfour Baking Company is one of our FAVE places for a sweet treat, a coffee or lunch date with a friend, or a delicious cake for a party. Bring a Sunflour creation to your next holiday party, or pick up something for the hostess and you will be deemed a favorite guest – we promise. We count on Sunflour as our go to for all our holiday baking needs. 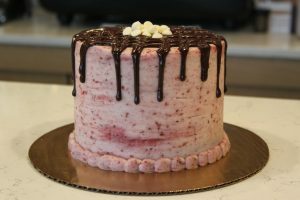 Sunflour specializes in cakes for all occasions and will create custom designs. We’ve tried many of these and they are the best in town! Need a cookie tray or any other breads or baked goods? Sunflour has you covered. One lucky Smarty wins a $50 gift card. Savory Spice offers high quality, fresh ground herbs, spices, and seasonings that are hand bottled and bagged daily. They strive to remain innovative and provide a fun, inspiring, and educational environment for customers. Whether you are in need of everyday essentials, a hard to find ingredient, or a gift- they have you covered. Live Life Full. They have the best items for those that love to cook, grill, & bake. We love dropping by there to pick up a few things because any item from Savory Spice is always a big hit! 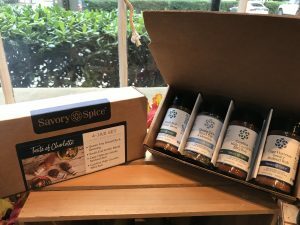 Giveaway: One lucky smarty will win a Taste of Charlotte Spice Pack valued at $24.95. This includes 4 spice jars: South End specific South End Grillin’ Blend & Queen City Bread Dip & Dressing Blend, and recipe card. Smarties, are you one of those people that likes to give thoughtful out of the box gifts to your friends? 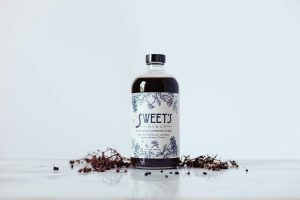 We think Sweet’s Elderberry Syrup is just that gift. This little bottle is filled with a SUPER immune booster and effective natural remedy for coughs, colds, the flu and seasonal allergies. It is recommended to take it daily during the flu season to help prevent getting sick and every 3-4 hours when symptomatic. Sweet’s Elderberry Syrup is organic, local and delicious kid approved flavor! One lucky Smarty will win a 16 oz. bottle of Sweet’s Elderberry Syrup. Prices vary. One of my favorite things to do is stroll the all the fresh produce at a Farmer’s Market. But, little smarty demands often get in the way and I am not able to go! 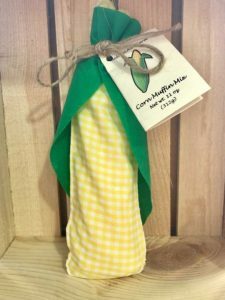 That is what I love about Farm Fresh Carolinas’, they bring all the goodies directly to you! In their boxes, Farm Fresh Carolinas provides all Organic Produce. No harmful chemicals coating your delicious foods. Their veggies aren’t coated in wax to make them look prettier. Organic agriculture is not only healthier for the consumer, but it’s healthier for the farmers, the surrounding communities and our planet’s resources. 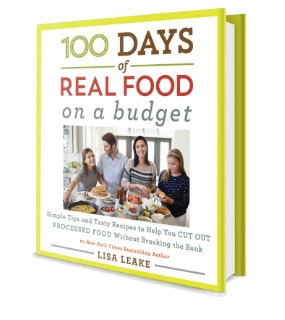 Local celeb foodie Smarty Mom, Lisa Leake, made a pledge in 2010 to cut out processed food for her family for 100 Days. 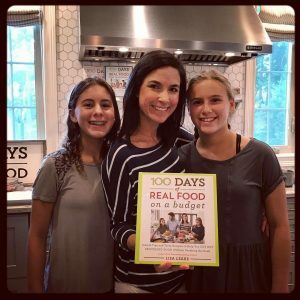 What started as a quest to help her family eat healthy and most importantly, understand what they were eating, turned into a worldwide movement. 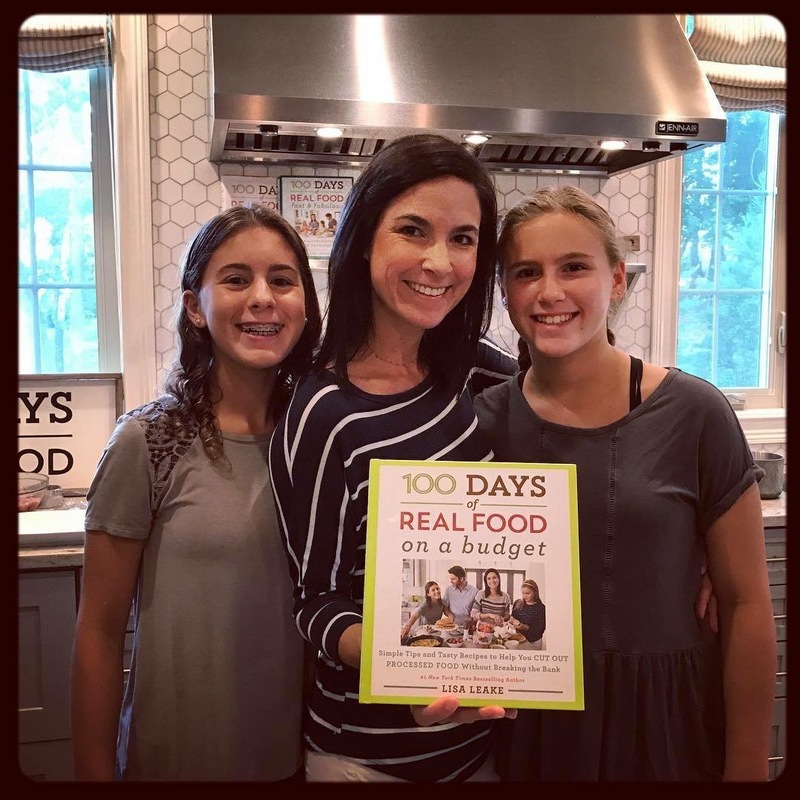 We are lucky to claim Lisa and her family as our own and we hang on her every word in all of her cookbooks and daily blog! You can also read our Smarty Interview with Lisa here, her family is adorable! 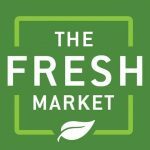 Did you now The Fresh Market’s first store was in Greensboro, NC? On a crisp North Carolina spring day, back in 1982, a new kind of grocery store was created. Our founders took their life savings and put it all into their dream: a fresh take on grocery shopping. They wanted to bring back the old-world charm of the local market and on March 5, they opened The Fresh Market for business. Smarties, whether you’re looking for delicious deserts or thinking of shaking up your holiday with something unexpected, The Fresh Market has got you covered! From wine to chocolate, flowers to holiday specials, visit The Fresh Market for you holiday hostess needs! 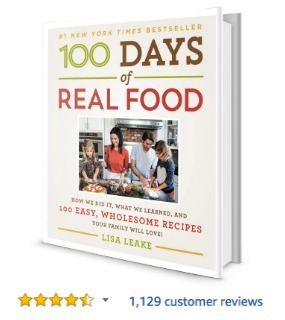 Click here for the Fresh Market Holiday Gifts & Hostess Guide. Click here for the Very Merry Holiday Wine Selection. 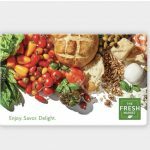 One lucky smarty will win a $50.00 gift card to The Fresh Market. Recently rebranded and now 2nd generation Charlotte family-owned, the Buttercup is a Charlotte icon tucked right in the heart of Myers Park and has been a Charlotte icon for over 40 years. The Buttercup is hands down the best spot to shop for gifts this holiday season – from candles, to jewelry, to art, and stationery, now offering in-house monogramming – you’ll find something for everyone on your holiday list, especially your hostess! 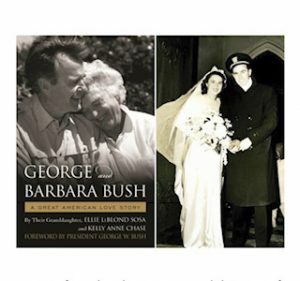 This year, Buttercup is sharing a very special, autographed copy of the newly released book, George and Barbara Bush A Great American Love Story written by Ellie LeBlond Sosa, with our Smarty audience. One lucky Smarty will win a copy of George and Barbara Bush A Great American Love Story, written by granddaughter Ellie LeBlond Sosa. Entering our Smarty Hostess Giveaway is easy! That’s it! A winner for each item will be picked at random. Giveaway closes on November 29th at midnight. Winners announced on December 3rd. Happy Holidays! I love the “crystal ball forest” on Hillside! I love all the center lights! We love driving around our South Charlotte neighborhood in pajamas with hot chocolate! My favorite is Hillside Avenue. Winterfest and Carowinds has an amazing light show! We love going to the speedway! Our favorite is Garden Oak Holiday Lights in Indian Trail. We love to check out the houses and yards decorated in Sherwood Forest, just off of Colony Road. The Speedway Lights in our pjs! The crystal balls at hillside! I don’t have a fave. I just like driving around and seeing what I find. No fave. Just like driving around discovering. Daniel Stowe botanical garden lights! Highland creek and Myers park are my fav light up neighborhood displays but Speedway lights are my favorite professional display. My favorite light display is the view from my sofa surrounded by my family! WE have a few, the speedway is always a winner and the neighborhood displays in Myers Park are always a hit!! There is a house on Sardis Road North near Monroe Road that goes all out. Big NOEL letters! We love driving around the neighborhood looking at lights ! It’s a Christmas tradition! We love driving around the neighborhood looking at lights ! It’s a Christmas tradition ! I love the Hillside Ave lights! I love Hillside because i can walk to it with the family! Love the house off of Colony on Sherwood Forrest Dr. that has the Santa out on the weekends and all donations go to St. Jude!! Growing up it was tradition to Saturday nights, between Thanksgiving and Christmas, to load up in the car in our Christmas jammies from years past and drive there the different neighbors rating the lights. Lights that sync with music or a house with a theme usually tie for first. I bundle myself and my dogs to stroll the light displays! The crisp air and twinkling lights is both a beautiful and peaceful time. We like to drive around and discover. We love the houses on Ardrey neighborhood. Elsmore Drive in Matthews/Weddington (Union Co). it’s like Clark Grizwald is real! My kids and I love the Hillside light display. We love how it’s from over the years! Love the Billy Graham Library lights and other holiday activities there! Daniel Stowe Botanical gardens is our fav, esp after Christmas. McAdenville has the mill history and so much charm. Love the city decked out in lights, but your own home decorations are always the best! Especially with any house lights off at night and just Christmas lights. We love driving around neighborhoods and especially the hanging lights on hillside. We love the lights at the Speeday! I like the old fashion type of lights that some houses have. Not too flashy just traditional and sweet. McAdenville is always a favorite! It has that old town charm feel to it. It reminds me of something you would see in a Hallmark Christmas movie! Our neighborhood on the night we do luminaries. We like discovering by driving around different neighborhoods.